Best Christmas Present Ever – Stampin’ Up! Happy Sunday folks, well I’m back again, not 100% but sooo much better than the last 2 weeks – thanks so much again for all your well wishes. Today, I’m here to tell you how to get the Best Christmas Present Ever – yes all your wishlist (well £130 worth of it) delivered to your door before Christmas. What am I talking about? I’m talking about purchasing the Starter Kit and getting your hands on £130 worth of items from the Annual catalogue and Autumn / Winter catalogue (before they go) for just £99, with no postage either! That’s more than 25% off! You can configure it to be your own kit, just what you want or need from your list. You choose up to £130 worth of products and pay just £99 – PLUS – you get 20% discount off all your future purchases too! What’s the catch? There truly isn’t one, whatever you purchase from that moment on you will receive at least 20% discount (pre VAT amount) and you get to join the Royal Stampers community with fun projects, group crafting, video links if you’re far away and a great private Facebook group where we share ideas and have a laugh! You can come to any of the Stampin’ Up! Events too – and as you saw from my previous posting about OnStage Live – they’re amazing! Are you locked in to spend a set amount – NO! Do I have to run classes or parties – NO! Isn’t it a pyramid scheme and I’ll have to force all my family and friends to buy huge amounts – NO! Will I stop being able to come to your Classes – NO! If you just love the Stampin’ Up! products, want to get them all at a discount and just do crafting for YOU and do what you LOVE to do – then you can take this offer. If your wishlist is more than £130 then whatever you purchase after you join you will get 20% discount on (before VAT) and you can still earn Host Rewards, half price items and more you’ll get points on your purchases too which can be redeemed online for product or other cool stuff. You also get to see the catalogues before anyone else, and get the chance to order before anyone else too! It really is a brilliant offer and one I’d like to share with you all! If you just want to purchase for yourself and keep it at that – that’s fine by me! Can you turn it into something else and run classes and parties – YES of course you can – but you don’t have to, that’s the beauty of this company – it’s all about being YOU not me! So, if you’re interested and want to know more about becoming a Royal Stamper, then please read about it HERE. If you’ve been debating about it for a while and now decide, yes I want the BEST Christmas Present EVER – then click HERE and sign up today. Or contact me directly via my Contact Me Form HERE and I’ll be in touch to answer all your questions. I’d love for you to be a member of our community and I’d love for you to have the best Christmas present ever. Here are some of the latest projects we’ve made at our group events. We have a lot of fun and laughter together – and it’s not just crafting – it’s friendship too. I hope you’ve enjoyed hearing a bit about this amazing offer, and seeing some of the fun projects we’ve been making as a group. Meanwhile, I couldn’t leave you without a little bit of crafting inspiration and instruction – here’s one of the cards we made at the last Simply Stylish card class. Emboss 3 pieces of cardstock (Bermuda Bay, Watermelon Wonder & Hello Honey) with the decorative dots embossing folder, then punch out one Pansy Punch shape from each piece. Stamp the stamens from Summer Silhouette in matching ink on Whisper White and punch out with the Itty Bitty Accent flower punch. With a Bermuda Bay card base, add a whisper white layer (14.4cm x 10cm) and stick down 3 strips of matching Cherry on Top Washi Tape. 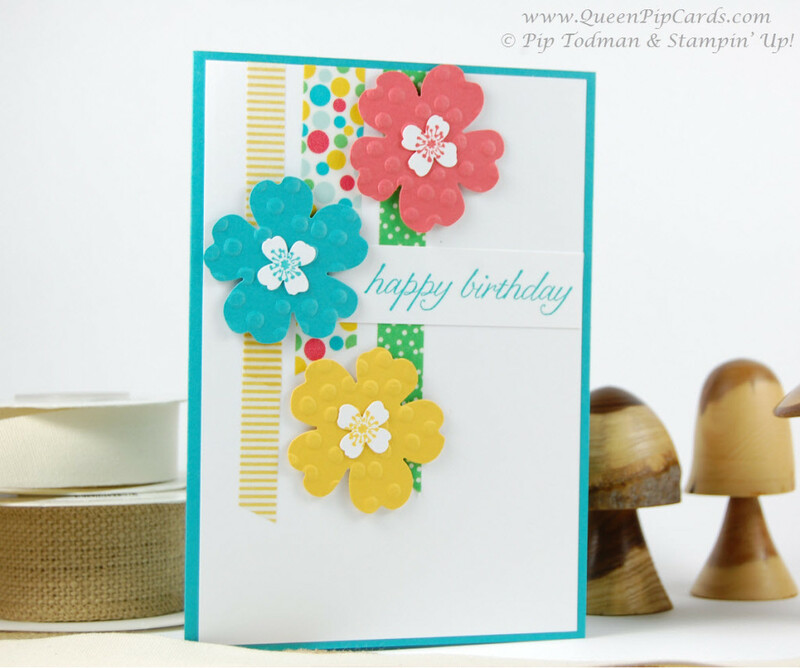 Stamp Happy Birthday from the Birthday Blossoms stamp set and add as a banner. Simple but effective isn’t it? 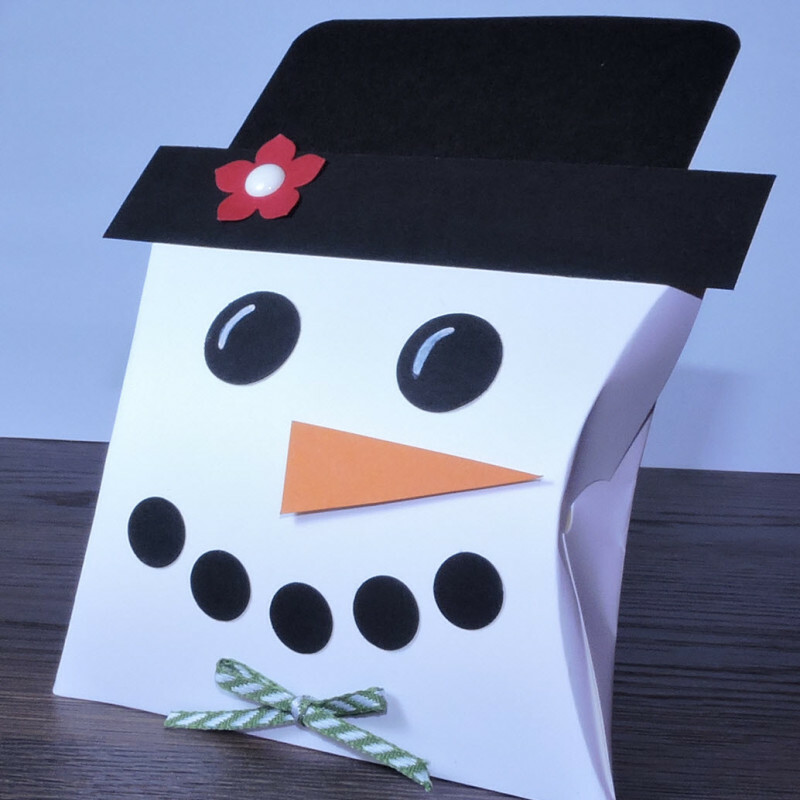 You could add these items to your Starter Kit and make them at home when it arrives! 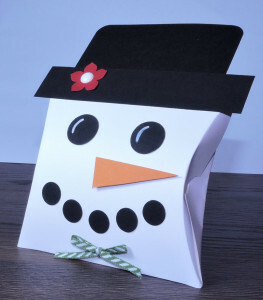 Alternatively you could add those to make the Snowman pillow box plus a whole lot more! See below for the list for both!